Parking Lot Exit Sign - 18x12 - Reflective Rust-Free Heavy Gauge Aluminum Parking Lot Signs with Anti-weather and Anti-graffiti protection Available. 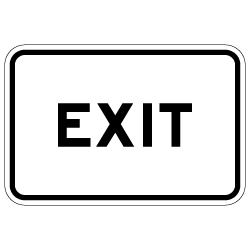 Parking Lot Exit Signs with Ahead Arrow constructed of rust-free, heavy gauge, durable aluminum. Parking Lot Exit Signs With Ahead Arrow 3M Engineer Grade Reflective sheeting and 3M inks. Parking Lot Exit Sign with Ahead Arrow is rated by 3M for at least 7 years no-fade service. Parking Lot Exit Sign With Ahead Arrow comes with holes drilled at top and bottom center for easy mounting.